After wining two national marketing awards for travel and tourism marketing and with ticket sales up following the success of 2016 campaign, the pressure was really on to deliver a 2017 summer campaign that would raise the bar even further. 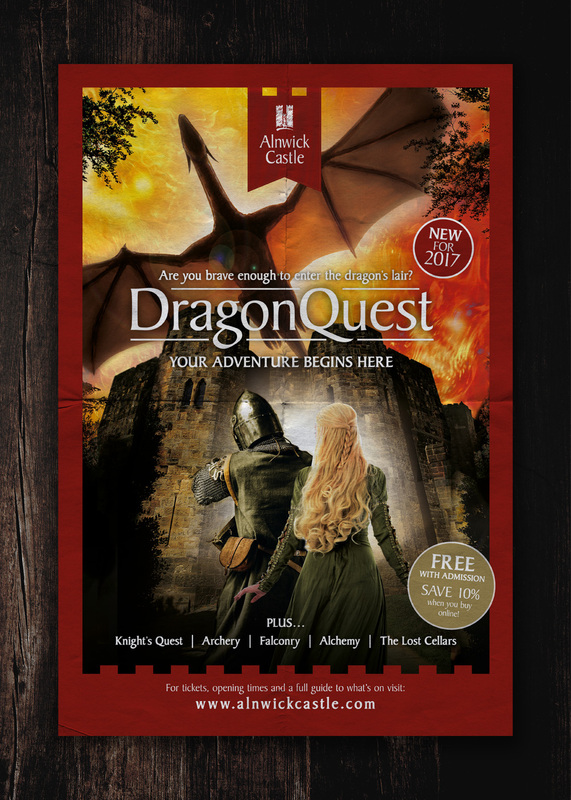 One of the main challenges of the summer campaign would be to persuade visitors of previous years that there is so much more to see at the Castle, particularly with the launch of so many new attractions and different themed weeks over the summer season. It was decided early on that the campaign would feature a dramatic cinematic style, where every execution (featuring the castle as the backdrop) would be treated to look and feel like it was actually promoting a different ‘theme’ and experience. One theme showcased the Castles link to Harry Potter and featured wizards, while a second theme focused and showcased the new dragons quest, and another had an engaging medieval theme featuring iconic knights. To date we know that since the campaign has been launched ticket sales have been very good, particularly with the schools recently breaking up and the legendary tropical North East weather largely holding up for once. We are already working on and planning a very spooky autumnal Halloween campaign so if you’re not too afraid of the dark keep watching this space!